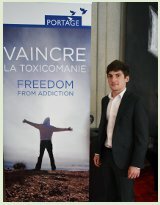 Surrounded by their family members and peers, the graduates of Portage’s various drug addiction rehabilitation programs in Québec were recognised this past fall at Portage’s Recognition Ceremonies in Québec City and Montréal for the new positive lifestyle that they have committed themselves to. The seven hundred guests that attended Portage’s annual benefit evening, La Soirée des Grands Philanthropes, this past fall helped make an important financial contribution to Portage’s drug addiction rehabilitation centres. Every year for the past thirteen years, this event of great renown has honoured a different Québec business person. For the first time in its history, the 2016 event paid tribute to a woman: Monique Leroux, President of Mouvement Desjardins from 2008 to 2016 and President of l’Alliance coopérative internationale. In order to facilitate access to Portage’s drug addiction rehabilitation services, Portage representatives will now be on hand twice a month at three of its partner organisations’ centres in the Capitale Nationale area. This collaboration will not only help Portage to get closer to a greater population of potential clients in need, but it will also facilitate the follow-up process for Portage graduates who are in the aftercare phase of their treatment. Les Habitations Communautaires Portage II, a brand new thirty-unit apartment building created to provide graduates of Portage’s drug addiction rehabilitation programs with access to supervised apartments following treatment, welcomed its first tenants this past fall. The building is now at complete occupancy, filled with a community of individuals full of hope for a healthy, happy, and productive future. Portage’s Mother and Child Program recognises that a parent’s issues with drug addiction can put a stressful burden on a child, which may affect his health, development, and relationships. In order to do more for the well-being of the family unit, the counsellors and specialised child care educators at the Mother and Child centre will soon be following an intensive training on stress management for preschool-aged children. 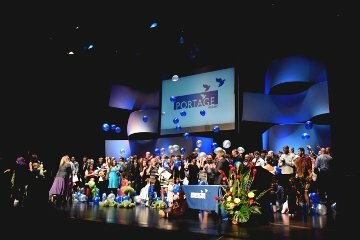 A cause that he holds dear to his heart, Hervé Pomerleau has been a fervent supporter of Portage for more than twenty years. With the recent launch of his book Hervé Pomerleau, bâtisseur du Québec moderne, Mr.Pomerleau encouraged his readers to donate to Portage’s youth drug addiction rehabilitation centres in Québec.